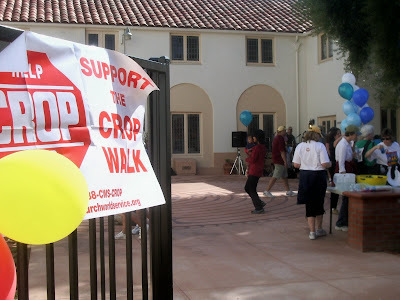 The 27th annual CROP Walk happened on a later date than usual. It happened because of scheduling conflicts with the church but later, after Daylight Saving Time had begun, turned out to be very nice. We had registration, stretching, and the pre-walk program in Trotter Hall. The runners left on Coach Burns' starter pistol shot, and the walkers left to the rhythm of Joe's drum . . . Upon their return, the runners and walkers were welcomed back by Bruce. Refreshments and music were waiting for them in the patio! Still photos can be seen by clicking here.